One of the best ways to solve any technical problems that a company's computers may suffer, especially if we want to save time, is to use an application that will allow a technician or administrator to control the computers remotely, like Radmin, for example. 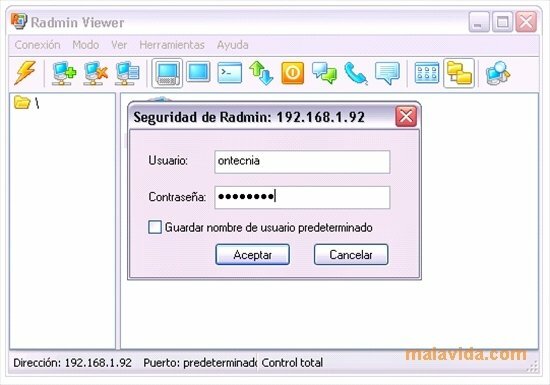 Radmin, also known as Remote Administrator, has two parts, a server application that has to be stored on the computers that we want to make accessible, and a viewer application that will allow the technician to access those computers remotely and carry out different actions on them. Perfect to give a friend some remote assistance. This tool can also come in very handy to give instructions to another user while we observe them, like a teacher, because it includes a chat feature (allowing both written and spoken communication) that can be used from both ends, thus allowing the user to tell the person in front of the computer what to do while watching them do it. Therefore, if you need to control one or several computers, or you need to observe and teach another user remotely, Radmin is the ideal tool to carry out this task.